Dymatize 100% pure pharmaceutical grade Creatine Monohydrate improves your muscles' performance during high intensity activities such as weight training, running and any other aerobic or anaerobic exercise. Dymatize uses only the highest quality, purest Creatine available, giving you the ultimate in muscle energy production. 300g. 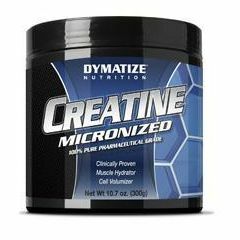 Dymatize Creatine Monohydrate has always been processed to an extra fine 180 microns ensuring proper dispersion. Dymatize Creatine Monohydrate is manufactured using only the most advanced techniques and conforms to the strict International Molecular Formula: C4H9N3O2H20. Laboratory Tested for Quality and Purity. These statements have not been evaluated by the Food and Drug Administration. This product is not intended to diagnose, treat, cure or prevent any disease. Consult with a physician prior to use if you have any medical condition. Do not use if pregnant or lactating. Keep out of the reach of children.